I have always loved blogging, particularly so since moving to my new site, I am genuinely excited about sitting down each day to blog. Like everyone though, I often get a bit of a writers block. This got me thinking that there really is no need to be short of a subject, since there are so many amazing businesses and charities that I could be promoting. I have always felt strongly that ethical purchasing was essential, and that companies going the extra mile to do their bit for charity, the community, fair trade or animal welfare should be supported. So now is my chance. I am going to run a feature every Friday about one fabulous, ethical company and one charity. So here are my first two, and what a place to start!! If, like me, you tend to struggle to decide what to buy certain people for Christmas, you may have heard of Send a Cow. If you haven’t, it will be right up your street. Instead of buying someone something that they don’t need for Christmas, you purchase something for someone who really does need it. Like this cow, who really, really needed a Christmas jumper (she didn’t). This is the hilarious new campaign by Send a Cow, who are trying to raise awareness of the brilliant range of charity gifts that are available. Their aim over the festive period is to sell 20,000 festive gifts that will make a difference for African families living in poverty. Whilst you can buy a cow (Christmas jumper not included) there are other options available as well. Two of my personal favourites are the little donkey package, which is only £9 and it helps families to care for their donkeys. This benefits both the animal and the family, who would really struggle without their four legged friend if something were to happen to it. My other favourite is the bee hive. This also strikes me as serving a dual purpose, since we are always hearing about the threat to bees and encouraging people to cultivate them will be beneficial to bees and recipients alike. Don’t take my word for it though, there are numerous other gifts available, with prices from £5 and up. The additional benefit of these products is that every recipient must promise to pay it forward. For example, they may give the cow’s first calf to another family, who would also benefit and then pay it forward. This starts a chain of events that makes the world a better place, one step at a time. I also wanted to tell you a little bit about a wonderful charity local to me. 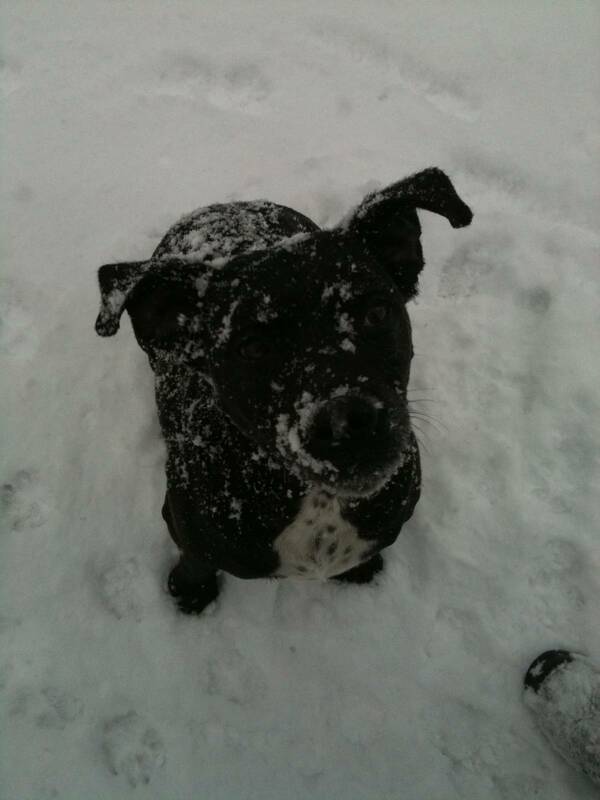 Happy Staffie dog rescue take on staffies, the most difficult to rehome dogs. They rehabilitate them, neuter them and pay vets fees where necessary and then care for them until the perfect home is found. I adore dogs and have to admit to having a real soft spot for Staffies. What I really don’t have time for is people who buy dogs in this day and age of hundreds of dogs being put to sleep every day, purely because they are unwanted. Until there are no dogs in rescue, we should not be breeding or buying puppies. In order to raise much needed funds for the dogs, Happy Staffie are selling these fabulous calendars. If you need a calendar or intend to buy one for someone this year, please consider buying one of these. They are absolutely gorgeous and the money raised from them will go to such a worthy cause. Besides, who could resist these persuasive eyes? Please note, this post is not sponsored or endorsed. The staffie pictured is our beloved Soxa who sadly passed away a couple of weeks ago. The cow in a Christmas jumper, I am gutted to say, is not mine. The photo was provided to me by Send a Cow. 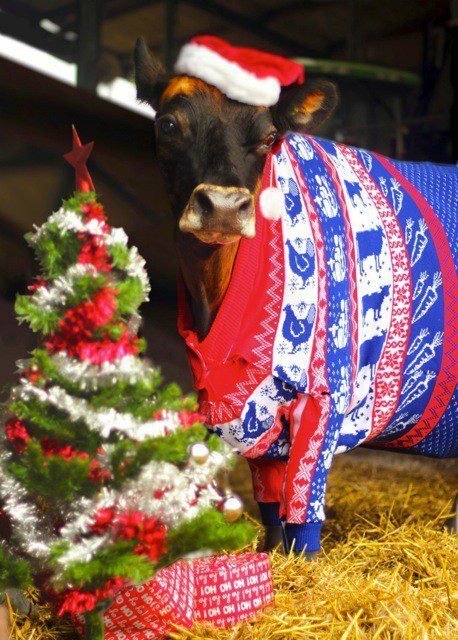 If ever I own a cow, it will wear a Christmas jumper.